A high-speed rail project that would connect O'Hare to downtown Chicago, Rockford, Champaign and beyond made a big step this week. The Illinois Senate passed a resolution on Sunday urging Governor Bruce Rauner and IDOT to prepare "an investment grade ridership analysis" for such a high-speed rail project. If acted upon, the resolution could bring about a study capable of attracting federal and private investments that would help bring the Midwest's rail system into the 21st century. It also calls upon Congress to pony up $2.5 billion for the project. The prospect of a high-speed rail coming to Illinois has long been talked about, but never executed. The Obama Administration has allocated more than $11 billion since 2009 to develop faster passenger trains nationwide, but the program has been widely considered a failure. The Chicago-based association played a big role in a recent $1 billion federal investment to speed up Amtrak trains in Illinois. 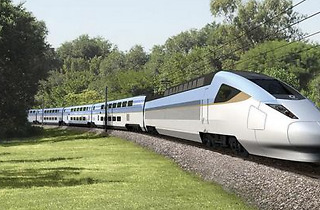 The group is hoping to have a similar success with this high-speed rail project. If all goes swimmingly, the new project would rebuild Metra's tracks in the city in order to handle both Metra and high-speed trains. The new study proposed by the Illinois Senate resolution would determine how plausible that would be. "What we should be doing is what a lot of countries have already done," said MHSRA executive director Richard Harnish. 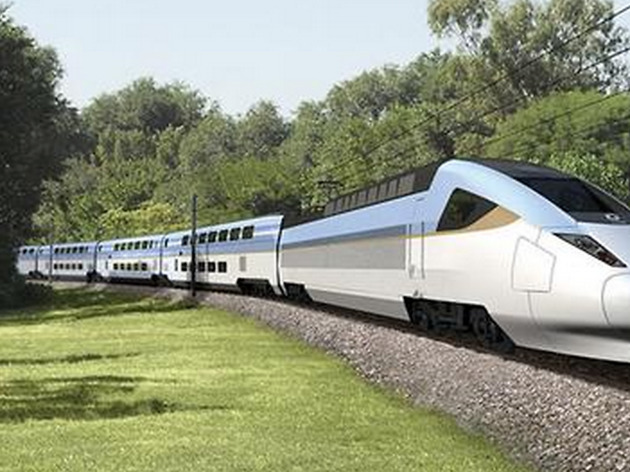 "We should be building a completely new track that brings high-speed trains to Illinois." Wasn't there already supposed to a a high-speed rail line scheduled for the Chicago-to-St. Louis run via Springfield and Joliet?? What happened to *that* plan? That's already in service, although the top speed is only 110 Mph and not on the whole line yet. It's being expanded over more of the line, but track upgrades take time. About time. Still 30 minutes to O'Hare is hardly high speed. A large chunk of this would already be in operation if Scott Walker hadn't shut down HSR in Wisconsin. O'Hare is *in* Chicago. What city was your headline written in? So this "high speed" train will travel from downtown Chicago to O'Hare in 30 minutes. According to Yahoo maps, that's a distance of 17.5 miles, and travel time by expressway without traffic is 29 minutes. So this amazing, high speed train is apparently going to travel from Union Station non-stop to O'Hare at 35 MPH. But you have to get from your hotel to Union Station to take advantage of this. So as long as you're getting into a taxi, why not have the driver take you to O'Hare instead? 29 minutes at 2 am perhaps. Average travel times are 1-2 hours door to door. A $8 taxi to union station makes sense most times between 7am-9pm. Ouch you had to go and mention Metra. Illinois is too broke to help out with funding so thats not an option and any investor is probably going to want Illinois to have some skin in the game. Also, the map has a lot of stops for a train that is going 220 MPH so would it ever reach those speeds? Sharing tracks is also an issue. Currently freight trains share tracks with commuter trains and these trains often cause delays, would it take away the advantage of a 220 MPH train if you're stuck behind a freight train? I think for this project alone to improve the tracks, buy new land for laying new track plus environmental issues, we would probably need all 11 billion of the feds money just for this project alone. After taking Metra for the past 2 years I can say commuter trains, suicides, accidents, mechanical problems, slow trains and unions are the biggest problems the Illinois train system has right now. Fix that and Illinois tax payers and the fed government can save a lot of money. These aren't new lines and speeds depend on the trains and you're right a 220 mph train to ORD doesn't make sense but a 70mph train might work esp if the metra tracks are used (w/o freight priority or use). I took a fast train from Paris to Basel recently. It was not super fast but went 70-80 mph with few stops and had priority over freight.